Guaranteed Gardiner Genetics is an animal identification program designed to add value to Gardiner-influenced commercial cattle. This program is designed to help Gardiner customers receive a potential premium for their investment in Gardiner genetics. 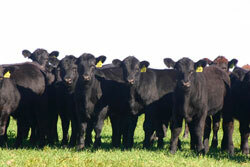 We know at Gardiner Angus Ranch more information translates to added value. Therefore, we believe this branded source and age verification program is the next step in providing an opportunity for Gardiner customers to make more money in the marketplace. 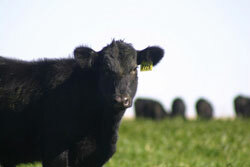 Gardiner Angus Ranch customers wishing to tag cattle with National Animal Identification numbers may participate. Eligible cattle must be sired by registered Gardiner Angus bulls or sons of registered Gardiner Angus bulls (50% GAR genetics). Only cattle enrolled by the original owner are eligible. All cattle enrolled are owned by the producer participant. 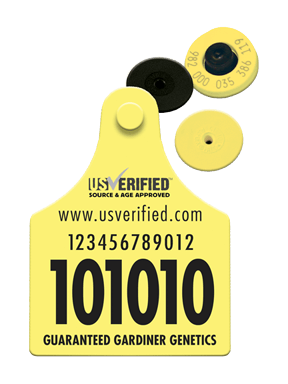 Only enrolled cattle will be identified with GGG tags. All cattle enrolled in this program have a known age by day/month/year. All participants must first complete a training and verification packet before tags will be allocated. Calves may be enrolled once they are born. Because this is an age and source verification program, tags cannot be allocated to animals without known birth date. Participants may enroll by contacting Mark Gardiner, (620) 635-2760, or Julie Tucker, (785) 408-1214.